Did I ever skip a family Thanksgiving because of bad weather making it inadvisable to drive? Or a bad cold? I know each has happened with a family gathering or two, but I think Thanksgiving has always come off successfully. A couple of times it's just been my parents and my brother and me, though probably only on their rare Thanksgiving trips to Ithaca. At least one of those we ate at a B&B's restaurant, and I remember being pleasantly surprised that it felt warm and cozy and holiday-like. Today was just my parents and me, since my brother and his wife were spending the holiday with her family, and the cousins who usually host the huge family dinner went south to visit another branch of the family. My parents didn't feel like putting together a fancy dinner at home for just the three of us, and who can blame them? So they made reservations at a favorite spot a couple of towns away. X20 Xaviars on the Hudson is a waterfront restaurant where my cousin's bar mitzvah was about four years ago, and my parents (and Jeff and Daina) have been there since. 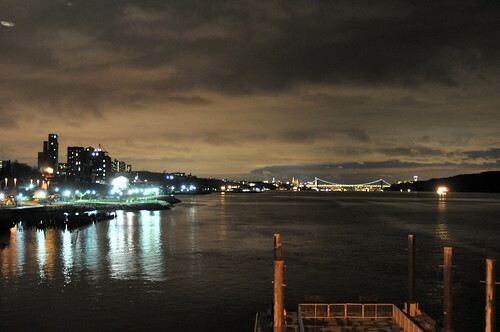 Here's the view looking south; that's the George Washington Bridge to the right, and the Manhattan skyline beyond. Definitely not a cozy meal, since the place was bustling, but they put together an excellent meal. The price tag looks high, but with each dinner including an appetizer, main course, and dessert, not to mention three different kinds of bread, and even an amuse-bouche pre-appetizer, I think it was pretty reasonable. Very good food, as well. There was of course turkey, served with apple-chestnut stuffing and giblet gravy, but none of us ordered it. I had turkey at our office Thanksgiving potluck on Tuesday, so I didn't really feel it was urgent, and there were other interesting options! Roast duck proved a good pick. Both Rex and Penny came with me to my parents' house, but I think my parents really just barely tolerate them being here. They really don't want them roaming loose in the house, so they've got to stay in the room with the door closed, or with me under tight control. Rex, especially, has been a bit antsy, and while my parents think he's cute (and they already love Penny), I think he makes them nervous. If I didn't really want to get to the hockey game on Saturday night, especially to see everyone who'll be there, I'd be tempted to cut the visit short for the dogs' sake. It should be OK. Think I'll see if I can embed the photo of Penny and Rex I posted to Facebook earlier, now that they have an "embed" link on photos. If it works, it's of the two pups on the futon in my brother's old room. Post by Mark H. Anbinder.